GSMArena team, 19 June 2015. Sometimes the biggest rivalries are between neighbors. The newest additions to clan LG and clan Samsung are from two different worlds - the organic LG G4 and the industrial Galaxy S6. One is curved with soft leather, the other is a cool glass and metal sliver. Samsung had a misstep with the S5 so it had to reboot the design for the Galaxy S6. 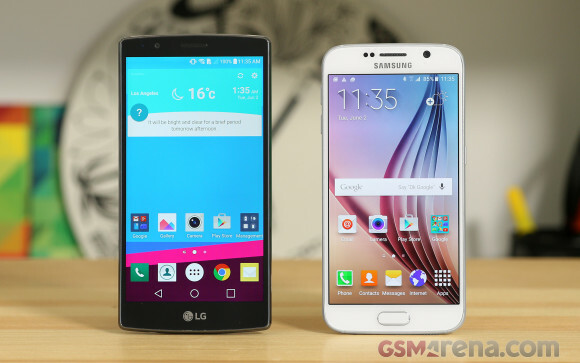 Meanwhile LG G4 is an evolution from its well-received predecessor. Both flagships took steps towards a luxury design though they are on very different paths. The LG G4 opted for premium leather and a slightly curved design (to stand apart from the Moto X). Samsung took the popular route and designed a slender metal frame sandwiched between two panes of glass. Larger screen - 5.5" vs. 5.1"
Consumer sentiment is highly important in this business and this time it seems like it's on LG's side. Users stuck with homely Galaxys because they were practical - light durable plastic, user-serviceable storage and battery. The Galaxy S6 design while beautiful introduced more glass that might get scratched and worse, it locked up the back panel. There were plenty of furrowed faces when battery and storage access was taken away so LG scored brownie points with the G4 that gives you full access to both. It has some longevity worries of its own though, Moto X's leather backs age pretty badly. It will be months before we know if the G4 will suffer the same fate, but at least you can always change the back with a fresh one. Not so with a scuffed Moto X or a scratched Galaxy S6. An overview of the two phones quickly reveals the points of contention. The LG comes with the bigger screen, but Samsung has perfected Super AMOLED. The G4 has unique camera features and a retooled camera software. The Galaxy S6 focused on getting the fingerprint sensor right and improving the health-tracking hardware. The Samsung also has the upper hand in processing muscle, thanks to Samsung's semiconductor fabs, while LG had to work around Qualcomm's difficult transition to next-gen processors. We'll dive into the details of these skirmishes, but we'll start with a mile high view and compare the hardware.